Here are the lyrics to some of the most popular Princeton tunes. There are a lot of other Princeton songs, and many of the songs listed here have interesting histories and lyrics that have evolved through time. 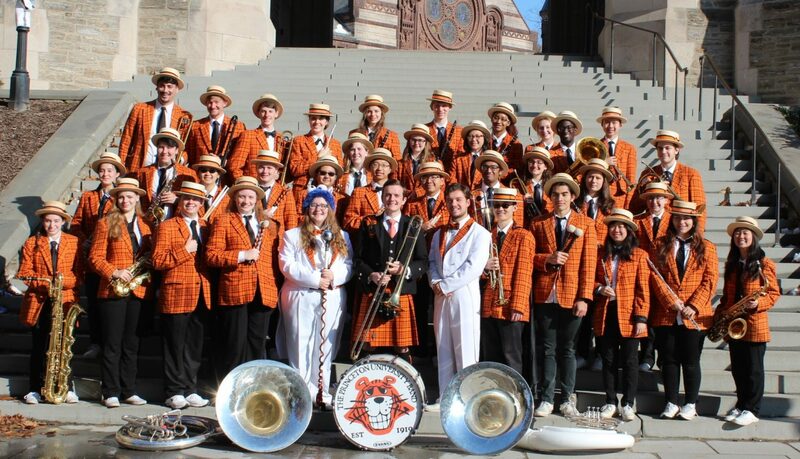 This is a fairly exhaustive collection of the lyrics to the Princeton tunes that the band plays. Recordings of all of these are also available. Long life to Old Nassau. Of the Orange and the Black. And the Orange and the Black. 'Neath the Orange and the Black. And send the backs on 'round the end! Rah! Tiger sis boom ah! That's the life for mine! To show we're true to team and crew. To show we're loyal through and through. This is the tiger's day. Yea! Fight with brain and brawn. Here comes that Tiger, wow! They'll never stop him now! When eleven Princeton football players start to score. And lead the way to where the going's rough. What is the one team that always wears the crown? It's that Royal Bengal Tiger down in Princeton town! Into the Tiger's den once more. Used to stand in days of yore. With a Tiger sis boom bah! Playing songs of Old Nassau. And you will hear the tiger's roar. and the bass drum sounding grand. And a zoom zoom zoom. Oh, when you hear the Princeton Band! Princeton's team today will win more laurels. Our Tiger team will win again today. Princeton will rule the stadium. Nassau will win the fight. Over the line we will push to score. Sing out our cheers for Princeton. Triumph will come once more. Give a cheer, when you hear the tiger's call. Let him roar, while Nassau wins the game. He'll defend to the end our fame. Singing yea! Let's go! Nassau! We shoot as one.